There are several muscles groups that should be exercised. Some would say that all muscles should be equally developed, but that is really hard to achieve and usually leads into professional bodybuilding, which takes a lot of time, certain amount of money and a lot of dedication. This is something most people are simply not willing to sacrifice, especially the money part. Several muscle groups that are usually exercised and developed through physical activity are pectoral area, arms, abdominal muscles and legs (usually quads). As for pectoral muscles exercise, there are two things that work best and they are push ups for those who do not use additional weight and bench press for those who prefer barbell. This is a great exercise that should be implemented in all training sessions, with or without additional weight. Actually, there is a weight of the body lifted in this exercise, so as body is heavier, muscles are growing more. Push ups should be done in several different ways. Difference is created with changing the position of hands on the floor, with alleviating the level of leg position, with clapping hands while going up, also using one hand only etc. One of the most difficult push ups is the one done in reverse stand up. Those who cannot do it properly should do it next to a wall, so that feet can lean on it. This is the ultimate exercise when it comes to developing pectoral muscles. All you need is a bench, a barbell and sometimes, help from a friend, especially if a lot of weight is lifted. This exercise can also be performed in several different ways. If hands are grabbing the barbell close to one another, arms are bit more focused (especially triceps). Torso part of the bench can be elevated and that also changes the way in which muscles contract. Weight should be increased each time a practitioner feels that weight lifted is not so strenuous, which is the basic principle of building muscle mass. 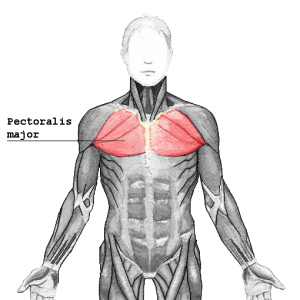 When it comes to the strategy used while building pectoral muscles or any other, there are two theories. One says that the entire training session should be done without one minute of pause, as fast as possible. This will create a constant tension and contraction in muscles, which should be excellent for muscle mass building. Other theory says that some short pause can do only good because muscles will be prepared for the next strenuous exercise.